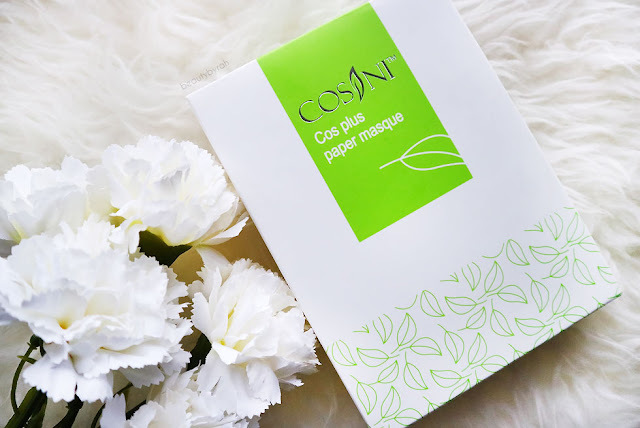 Recently, I was introduced the the brand, Cosini, and I have been trying out two products from them, namely the Cell Formula Camu Oxygen Serum and the Cos Plus Paper Masque which I will be sharing more about in this post. As I have not heard of this brand before, I had to do my research. 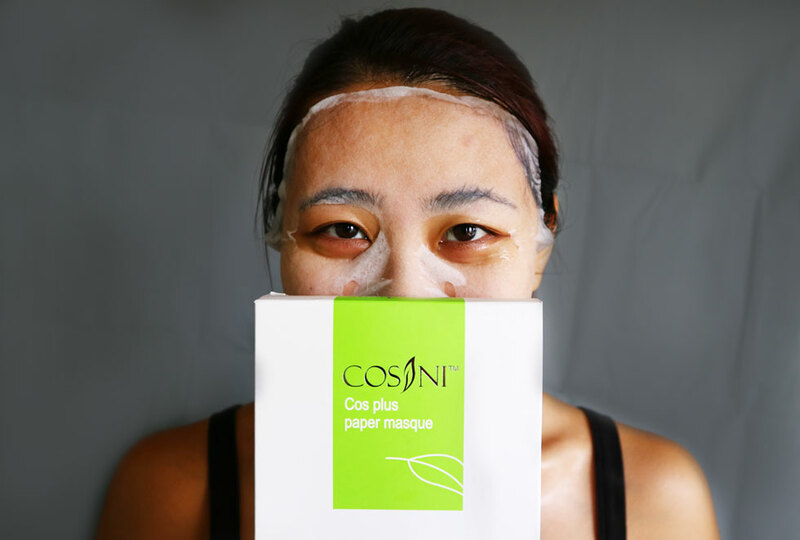 Cosini was founded in 2007 with its focus on formulating products for the Asian market, targeting major skin issues such as acne and pigmentations. According to their website, Cosini formulas are extensively researched, scientifically formulated and clinically proven for efficacy and safety by the international Cosini Team of over 100 scientists. Lastly, Cosini skin care products uses 100% natural ingredients which are scientifically formulated and clinically proven and its formulations are developed in Germany. I do suffer from dehydrated skin and I do love to try products that claims to boost the hydration levels in my skin. 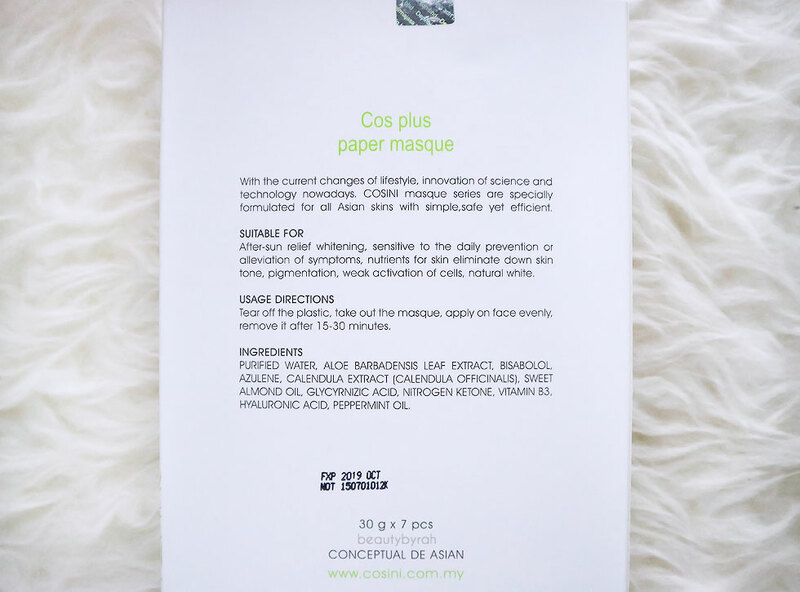 The Cos Plus Paper Masque is an intensive moisture-boosting mask that is also meant to soothe and hydrate the skin. This is said to help to achieve radiant, soft and beautifully clear skin and is specifically formulated for all Asian skin. The description behind the packaging isn't the best, but from what I have gathered and interpreted, this masque helps to even out the skin tone, reduce pigmentation, and in skin renewal and skin whitening. From the research that I have done, this masque does seem like a pretty recent launch for the brand. It comes in a box of 7 sheets (each 30g). Let's talk ingredients. My analysis of the ingredients is a combination of research done on the sites, Paula's Choice Cosmetic Ingredient Dictionary, Cosmetics Info, CosDNA and EWG's Skin Deep Cosmetic Database. Aloe Barbabensis Leaf Extract (Good) : This has soothing properties, antioxidant qualities, and serves as a hydrating agent for skin. Bisabolol (Very good ): This is a soothing agent typically extracted from chamomile and research also shows it might have some skin-brightening properties. Azulene (Average): This can have antioxidant, anti-inflammatory and skin-soothing properties and it is a chamomile extract used primarily as a coloring agent in cosmetics. Calendula Extract (Good) : Extract derived from the plant commonly known as pot marigold and it may have skin-soothing and antioxidant properties. Sweet Almond Oil (Good) : This is an emollient and is a rich source of skin-replenishing ingredients including triglycerides and several fatty acids. Glycyrnizic Acid : Despite this being stated as is on the list, I believe there is a typo, and it should be Glycyrrhizic acid which has moisturising and anti-inflammatory properties. Nitrogen Ketone : I can't find anything on this ingredient on all four platforms or google. That is a little.... suspicious, if you ask me and I am feeling pretty doubtful. Vitamin B3 (Very good) : This is more commonly known as Niacinamide, which is aids in hydration and restoring the skin's suppleness. It also has the ability to visibly improve the appearance of enlarged pores, uneven skin tone, fine lines, dullness, and a weakened skin surface. Hyaluronic Acid (Very good) : This is skin-replenishing ingredient that can boost skin’s moisture content, soothe, and defend against moisture loss. It is capable of holding up to 1,000 times its own weight in water, making it an optimal hydrator for all skin type. Peppermint Oil (Average) : This contributes to the fragrance of the product and could be potential skin-sensitising. It could also function as a skin conditioning agent. 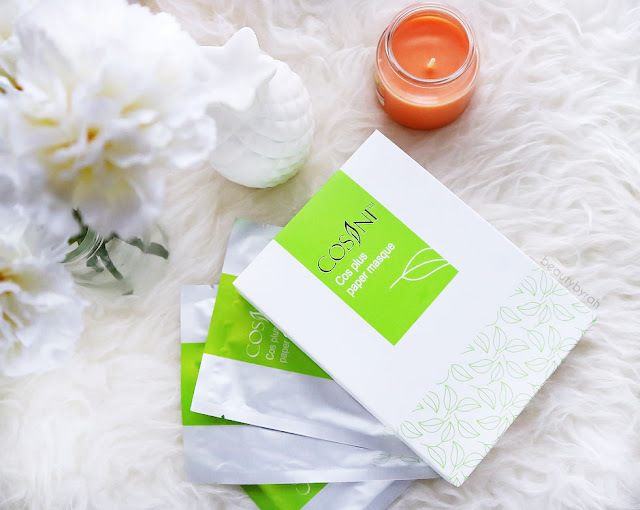 Looking at this list, the ingredients do seem pretty good and the masque could be a hit, with the exception of Nitrogen Ketone (which still bugs me about the lack of information) and Peppermint Oil. There is no alcohol (hurray!) or any preservatives, for that matter. I also like the short ingredient list. Many products now have sooooo many ingredients and some are completely unnecessary or worse, bad for the skin. 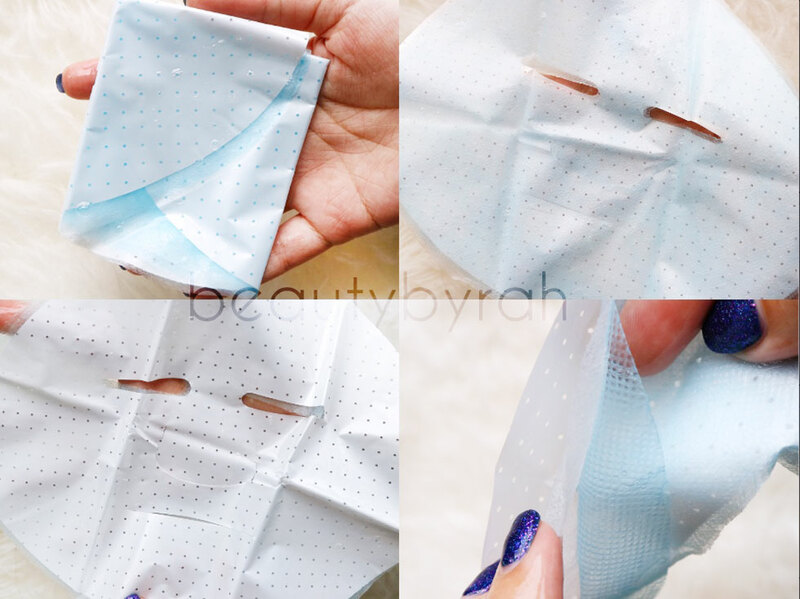 When first opened, the masque comes in 3 layers - plastic sheet, the paper masque itself, and a blue net like sheet. Personally, I am not completely sure why it requires 3 layers and I am also not sure of correct method of application but it really is just the matter of getting it on my face. 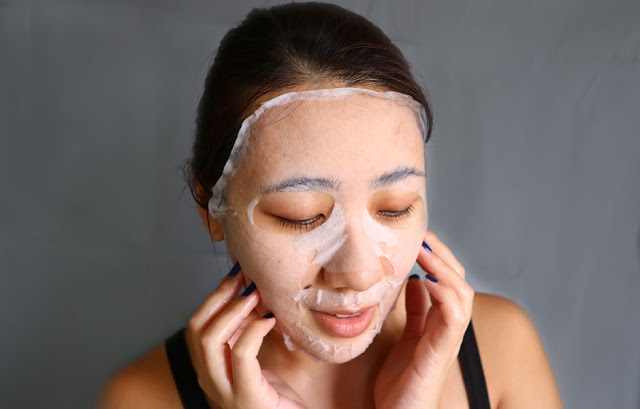 For my first time, I did struggle to apply it onto the skin as firstly, I was confused and next, the blue net layer has really small eye holes and when I was applying the masque onto my face, the essence got into my eyes and goodness, did that burn. I got wiser the next time round and I just peeled off both outer layers of the masque and positioned the paper masque onto my skin. This may not be the right method but it was surely easier. If I am doing it wrong, please let me know in the comments below! I like that the sheet of paper masque is really thin so it moulds really nicely onto the facial contours and sits nicely without drooping. The amount of essence is also great, as it wasn't messy and dripping everywhere. The scent of peppermint is pretty strong so those who tend to dislike scents, this may not be your best option. 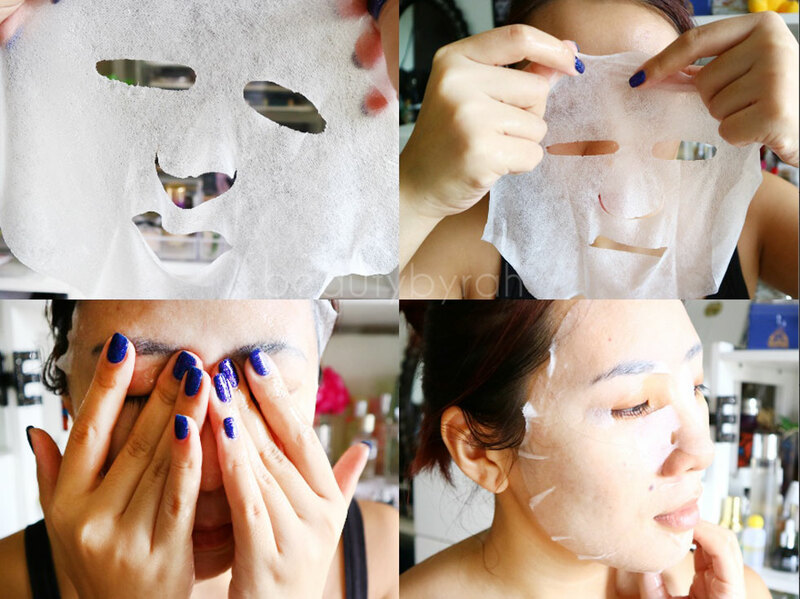 The masque also tingles slightly on the skin, starting about a minute or two after application. Now, many people might like this sensation as it feels cooling and especially great if you just got burned from the sun. However, this actually is not a great sign as the cooling, refreshing sensation menthol causes is direct evidence that your skin is being sensitized, not soothed. After removing the masque and massaging the remaining essence into the skin, I did notice that my skin is definitely more hydrated and plumper. I do not really see any improvements in skin tone or whitening, but that could be seen with more uses. I will update here if I see any other improvements. I've been masking more recently, as nobody wants to enter 2017 with dry and dehydrated skin! Not the most attractive picture, but who looks good with a face mask anyway? Ok, maybe just not me. The pack of 7 sheets retails for SGD 54 and can be bought at Beautix.Co. Currently, they have a 20% discount so it is only going for SGD 43.20! 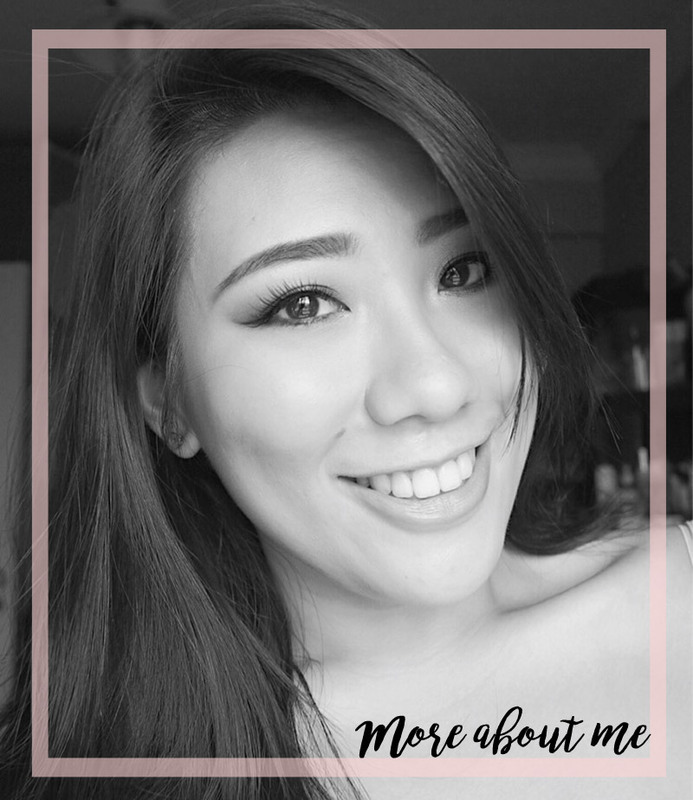 **Disclaimer : This post is sponsored by Beautix.Co. Only my true and honest opinion and experience are shared here, without influence from others or the brand.